Fab Spa Parties is a group of beauty professionals. Hair stylist, Makeup Artist, Massage therapist, Anesthetics, Eyelash, Microblading Professionals and Photographers all brought to you for your special day! We will customize your beauty package for your special day. We are a mobile spa or beauty studi or come into our location. Our products are 18 hour wear and smudge proof, kiss proof, long lasting. Only good quality products are provided. Looking forward to seeing you soon. 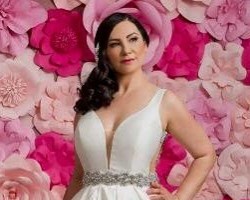 Stevee Danielle Hair and Makeup is a studio that offers comprehensive bridal packages to ensure you look beautiful and confident. This company has been operating in the area for over 6 years and has become well known for their bridal beauty services. All of the prices are affordable and all of the services will be provided by a highly trained makeup artist in Las Vegas, NV. Every service you could possibly need to look and feel beautiful on your wedding day can be found when you work with Beauty Extraordinaire. This company offers professional wedding hair and makeup as well as all of the extra and finishing touches that will bring the entire look together. This team will meet you at any location you would like so you can get ready in the comfort of your hotel or you can choose to have your makeup done in their salon. 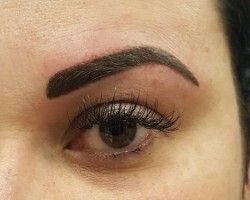 Girlz Ink Studio offers permanent makeup so you will always have a base for your daily look or for special occasions. This company is licensed and certified with a variety of beauty options for you to choose from. You can request to have lip liner or eye makeup applied. Whatever you choose, you can be sure that an expert at this boutique will complete it flawlessly. If you don’t want to worry about your makeup getting ruined on your wedding day then this is a great option. Whether you would like a natural look or would like to be completely transformed for your walk down the aisle, the team at Hair’z Melinda is there to help. This team has a range of beauty services for you to choose from to include in your bridal package, but the most important is definitely the makeup. Reviews of this company rave about how long lasting the makeup is and how good it looks in person and in photographs. Being flexible to the needs of clients is what makes this a great Nevada beauty service for weddings. Your bridal makeup should be more elaborate than your everyday makeup. When you come to Bella Mi Salon, you will work with one of the best Las Vegas makeup artists to make this happen. They will listen to the style that you are going for as well as preferred colors and tones. From there, they will design a look that meets all of your wants and makes you feel beautiful at the same time. You can even come to this salon for a trial run of the look to be absolutely sure it is perfect for your wedding.